» The solution to Windows DVD Maker not working? The solution to Windows DVD Maker not working? I was able to use Windows DVD Maker for burning my video clips on a DVD and it’s working just fine. However, when I try to import MKV files for DVD burning it just don’t work. I googled the solutions, but it shows that MKV is not the supported video format by Windows DVD Maker. Can you help me to figure out what to do? Thank you. As we all know the Windows DVD Maker is a program that is designed for all computers that runs under the Microsoft OS. This DVD maker offers all of the basic functions that we can get from a DVD maker. So far it is one of the commonly utilized programs for creating and customizing DVD’s. However, there are certain type of file formats that are not compatible with this tool, which includes MOV, VOB, and MKV format. This incompatibility issues often leads to a Windows DVD Maker problem. Furthermore, if you are experiencing Windows DVD Maker not working due to incompatibility issues, then it is advisable to convert your MKV file to a one that is acceptable. And for the program to use, I recommend using Video Converter Studio, a program that is specifically made to meet all of the users converting needs. After having the compatible format, you can now import this file on the Windows DVD Maker for burning. But if you wish to add subtitles, edit and merge video files prior to burning, then you can do this after the conversion with the use of the added features of Video Converter Studio. On the other hand, even if Windows DVD Maker performs well, there are still some concerns that are related to it that needs some update or fix. Aside from file incompatibilities, some troubles in using this program includes error messages while using it, if it is stuck on encoding it freezes and won’t burn and recognize different video formats. If you don’t want to experience this flaw it is better to look for a more sophisticated DVD Maker to avoid this issues. If you are looking for a perfect alternative to Windows DVD Maker, you can make use of this video to DVD Creator. Unlike Windows DVD Maker this tool can process whatever file type that you have, it accepts any format regardless if it is a image, audio, or video file. It also works smoothly without any errors and troubles. 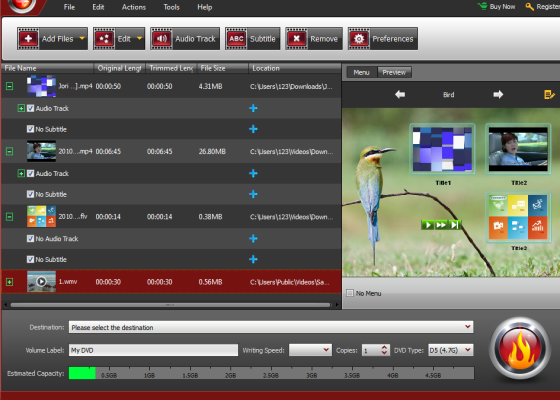 It also has many other features to use which includes: free menu templates for DVD customization, edit and add audio tracks, a powerful built in video editor for better personalization of your DVD content, and most of all it has the capability to burn all SD and HD videos to DVD at a faster rate possible. It is rare to have a DVD maker that can also function as a audio and track editor, that is why we can easily say that this program belongs to a top of the line DVD maker that is worth trying. Moreover it is also why using this tool will give you much of a benefit than using a DVD maker that most of a time have an issue of a Windows DVD Maker won’t burn.